Colour is so important to us. See a cheery one, a dismal one, a dull one, and it’ll do something to your mood. Elevate it or depress it perhaps. And here’s this lady in a resplendent pink with a bit of dazzle standing against some in-your-face posters. She’s waiting for a bus at the top of Rye Lane. Going where? Nunhead, Forest Hill, New Cross, Sydenham: they’re all up the road. Different roads… some of them start from here. 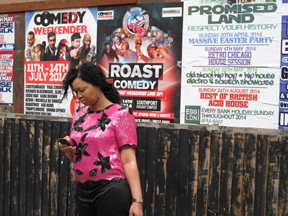 This entry was posted in New Cross, Peckham, Photography, Writing and tagged colour, Peckham, Pink, Rye Lane, street photo. Bookmark the permalink.